When it comes to paper documents, you can never be fully sure that you're being compliant with GDPR and this can present itself as a huge problem. Over the past few months, the world has witnessed the frustration many businesses have faced with the implementation of the General Data Protection Regulation (GDPR) coming into action. Although this legislation has been enforced by the European Parliament, it will continue to impact businesses around the world that have relationships with European consumers. With aims to unify and strengthen the data of European citizens, GDPR is a topic that has been dominating mainstream media around the world in the lead up to its implementation date. Although the 25th of May has passed, and businesses believe that they have become compliant with the regulations, they must continue to monitor and adjust their operations to avoid the harsh penalties that have been set out. These include: 4% annual global turnover or €20m fee – whichever appears greater in relation to the non-compliant organisation. If your company does experience a data breach, you have a duty to report the issue to the Information Commissioner’s Office (ICO) within the first 72 hours of becoming aware. As well as that, any breaches that adversely affects an individual’s rights and freedoms, those people must be informed without any delay to prevent any further disruption. Clearly, GDPR requires businesses to spend a lot of time staying within the lines — something that most businesses do not have time or money to do. Although most articles looking at GDPR covers how storing information digitally can be dangerous, we’ve teamed up with Maplewave, telco retail specialists, to look at how keeping traditional records, such as paper documents, in your business could be damaging. With digital alternatives such as the cloud and tablet signatures, many people believe that businesses have turned away from keeping paper documents. However, 31% of businesses are still ‘piled high with paper’ and only 17% are almost paperless all together. With GDPR now in force, it has never been so risky to store paper documents, as greater responsibility falls upon businesses around the world who find themselves handling such materials. Consumers now have the right to know that their data is being handled in the safest way possible and, if not, this legislation has made it easier for them to seek legal action if they require — to help combat potential data breaches. Monitoring paper documents and ensuring that they’re handled in line with GDPR can be both a costly and timely job – and may require dedicated teams to keep on top of issues at all times, which some businesses might struggle with; leading them to go paperless. One part of this legislation that businesses are finding hard to deal with is the right to erasure, which is commonly referred to as the ‘right to be forgotten’ — coming under Article 17 of the regulation. For organisations which have kept information for a long period of time in an insufficient way because there has been no previous enforced structure to follow, this could potentially be detrimental and cause great implications on their business. With paper documents, you can never be fully sure that you’re being compliant with GDPR and this can present itself as a huge problem. If a customer who has previously given their personal information to your organisation was to make a request to erase their details, you will find yourself asking many questions throughout the process of removal. You might find it difficult to remember where this information is stored, for instance – whether it is on the premises of your business or has been stored externally. You might even be wondering whether you still have the information; regardless, you will still be required to check, which could slow down business operations on a much larger scale. As technological developments continue to prosper, our office equipment is becoming outdated and many businesses are failing to upgrade; which could be problematic regarding this legislation. Products are becoming smarter, which is allowing us to have greater control over operational activities. These include printers and fax machines, which are now referred to as internet-capable and end-point devices and although this level of accessibility is beneficial, there are some drawbacks that accompany it. However, it must be made clear that most GDPR-related issues that come from printing paper will likely be from human error. If a sensitive document has been sent to print and, assuming that the printer does not have a pull-print solution (which allows an authorized individual to release the paper), the wrong person could collect the document. If this document has classified data on it, you’ve had a data breach. If you fail to put the right solutions in place, it will make it harder to monitor what is sent to your printer and what is actually released. This could make it difficult if you were to have a data breach, as investigations would need to try and find who was responsible and who picked up the documents. It’s extremely important that your business explores ever avenue of how to become more compliant with GDPR to prevent any penalty risks. This legislation has made waves among companies around the world, not only those who are fully based in Europe — there have been floods of reports accusing the likes of Google and Facebook of non-compliance within the first few hours of the legislation being introduced. Implementing a paperless strategy could be beneficial to your business if you find yourself dealing with a lot of personal data in paper formats, which is probably more common than you think. 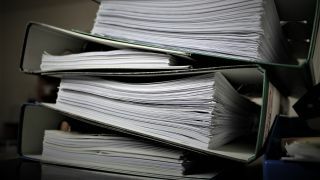 Not only would this help reduce the stresses of dealing with countless paper documents and storing them safely, it would also see you take a cost-effective/profitable approach to complying with the new ruling set out by the European Parliament. On top of all this, your company will also be helping safeguard the environment, as worldwide paper use has increased by 400% over the last four decades. This has obviously taken a huge toll on trees. Not only that, it takes 1.5 cups of water to make one sheet of paper — putting a strain on the world’s water supply.